This website is for informational purposes. None of the information within this website or anything related to this website is warranted to be accurate or complete. The IGA does its best to be as accurate as possible and asks the same of those who provide information on this website; however, no guarantee of accuracy is implied or warranted. The International Glass Alliance respects your privacy. It does not share, sell or transfer any visitor's information. The IGA does not release personal information, including names and addresses that visitors and supporters of IGA have given to IGA (unless the law requires). The IGA has and utilizes only information any visitor chooses to provide. When you browse or visit a website, certain information may be collected to measure and sometimes track users, viewers and the number of visitors to the website or specific pages within that site with what are known as "cookies." There are no "cookies" within the IGA website. If your browser is set not to allow "cookies," your browser should easily access any part of the IGA website. The IGA counts the number of visitors to its site to ensure the quality of the website and to note quantitative ratios for those who may sponsor and advertise. The IGA does not collect personal information, with the exception of any material a visitor chooses to offer to the IGA. Regarding IGA email responses, the IGA does not automatically access a visitor’s email address or name unless the visitor provides them to the IGA. If a visitor completes any IGA online forms, the IGA only will have access to the information the visitor provides. The IGA does not participate in sharing, selling or transferring personal information unless specifically requested by the visitor. If a visitor links to other sites from the IGA's website, he or she is subject to the other websites’ policies, which may differ from those of the IGA. The IGA is not responsible for anything from another website to which a visitor links from the IGA website. The International Glass Alliance does it's best to ensure the quality and timeliness of the information and data on it's website; however the IGA does not warrant or guarantee the accuracy or reliability of information on it's website. 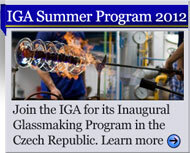 The International Glass Alliance does not participate in any type of pop-up advertising. If a visitor receives pop-up advertising, it may be either from the web browser, the website previously visited, or possibly, by third-party software that was installed outside of the IGA onto the visitor’s computer. The IGA does not participate, endorse or use any products that would produce pop-ups on a computer. For any inquiries about these policies, please contact: director@internationalglassalliance.org. Thank you. 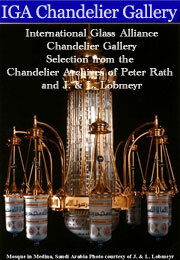 Glassmaking is part of all of our global cultural heritage. 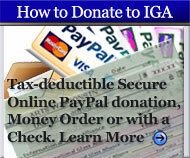 Visit the IGA Support Page for information about how you can help today!